Did you see Cloudy With A Chance Of Meatballs when it came out in 2009? This hilarious movie about a town where food falls from the sky was a huge hit with kids and grown ups alike. Now the sequel, Cloudy with a Chance of Meatballs 2 will be hitting theaters this Friday, September 27. You will soon get to catch up with inventor Flint Lockwood and his gang and join him on his next adventure. I do not know about you, but my family can hardly wait. I mean, when you have someone yelling “There is a leek in my boat” and the camera pans to a leek sitting in the front seat of the boat, you cannot help but crack up! Fandango has got some exciting news for families that I think you are really going to love! They have partnered with iTunes to offer folks an amazing deal that you are sure to jump at the chance to participate. Fandango, is the nation’s leading destination for moviegoers, selling tickets to more than 20,000 screens nationwide. In addition, to entertainer moviegoers, Fandango offers reviews, commentary, celebrity interviews and trailers. Customer can easily select a film, plan where and when to see it, and buy tickets online in advance. At many theaters, fans can print their tickets at home or receive them as a paperless Mobile Ticket on their smartphones. You can access Fandango online, via smartphones, tablets and other mobile devices. In addition to being the go-to destination for guaranteed tickets, Fandango has partnered with iTunes to bring fans an extra tasty treat: they are giving away free downloads of the first movie to own when you buy tickets to the sequel. How cool is that? For the family oriented folks in the crowd, Fandango has a wonderful hub for you called Family Room. This is an area where parents can plan the perfect family night out, all without ever leaving the house! There are tons of reviews and articles relevant to the movie industry but specific for family friendly movies. You can see which movies are best for your kids by browsing their age specific categories. There is even a section on kid friendly movies that parents will enjoy just as much. You can keep up with the latest news from Fandango by liking them on Facebook and following them on Twitter. Also, be sure to download their mobile app so you can purchase your tickets from your phone and check in with the app once you arrive at the theater. To keep up with the latest from Fandango, be sure to like them on Facebook and follow them on Twitter. 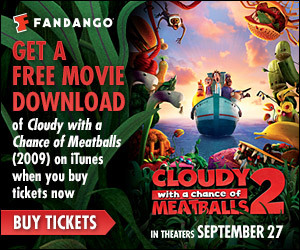 In celebration of the premier of Cloudy with a Chance of Meatballs 2, Fandango is offering one USA reader a family pack of 4 tickets valued at $42. I am excited to see Cloudy with a Chance of Meatballs 2. My daughter and I want to see Gravity. I want to see Catching Fire when it comes out! I would like to see Captain Philips. My kids have been begging me to see cloudy with a chance of meatballs 2! i’d like to see Hunger Games CAtching fire after that. I want to see Prisoners! I am excited to see Gravity. I want to see Cloudy With a Chance of Meatballs 2 with my 2 granddaughters. I want to see cloudy with a chance of meatballs. I wanna see Don Jon and Catching Fire!! I want to see Cloudy with a Chance of Meatball 2. I want to see cloudy with a chance of meatballs 2. My son wants to go to “Catching Fire”. I would like to see the Tom Hanks movie. I want to see the new Thor movie. I want to say there is a new Thor coming out…. I want to see Captain Phillips. I want to go see Gravity. the new movie with vince vaugn!! I want to see cloudy with a chance of meatballs 2! I really want to go see Catching Fire! I’d like to see either “Rush” or “Prisioners”. Thanks for the giveaway. I want to see the new Frozen movie! Gravity. that is is the new hot one. I’m excited to see Gravity! I definitely want to see Catching Fire! I read all the books two years ago! the new hunger games movie!! so excited. Catching Fire! Loved the Hunger Games. i would like to see gravity with my friends, thanks! I can’t wait to see Thor 2 in November. My husband and I want to see gravity. I am looking forward to see Frozen and cloudy with a chance to meatballs 2. I’m looking forward to seeing Gravity. Gravity 3D is the best movie of the year according to a Fandango interview. I love to see it. My coworkers have said good things about Gravity. I want to see that now! I can’t wait to see Carrie. I’m excited to see Frozen! I want to take the kids to see either Cloudy with a Chance of Meatballs or Free Birds! I’d like to see Percy Jackson: Sea of Monsters. I can’t wait for the new HUnger Games! I want to see Frozen when it comes out at the theater. Thor would be my top pick right now. I’d like to see Gravity. We want to see Gravity. Waiting to see The Fifth Estate! Gravity is the next movie we will see. I keep hearing about this Gravity movie but I think I will go with Cloudy #2. I’m excited to see Runner Runner. It looks pretty darn good! I can’t wait to see Hunger Games: Catching Fire. I am super excited about riddick. Would love to catch it the theater. Thank you! I’m excited to see Catching Fire. I’m excited to see Catching Fire! We want to see walking with the dinosaurs coming out on Christmas! I can’t wait to see Catching Fire. My favorite movie at this time that I would love to see is Gravity. I would love to see Gravity with Sandra Bullock. thanks for the chnace to win. I want to see Prisoners. I like all kinds of movies, but the dramatic thrillers are my fav. I want to see Don Jon. I want to see Enough Said. I would love to take my daughter to see Cloudy with a Chance of Meatballs 2. I want to take my kids to see Cloudy with a Chance of Meatballs 2. I’m excited to see Escape Plan. I want to see Hunger Games Catching Fire but also want to take my kids to see Cloudy with a Chance of Meatballs 2. I really want to see Hunger Games: Catching Fire. I’m seeing Gravity in 3D this Friday night. I want to see cloud with a chance of meatballs 2 – part 1 was our favorite so we gotta see the second one. I want to see Insidious 2. Can’t wait to see Catching Fire! I want to see Disney’s Frozen.Thanks for the chance. I am looking forward to Catching Fire and American Hustle. I want to see “Grace Unplugged”. My youngest daughter is begging to go see Cloudy With a Chance of Meatballs 2. Thank you! I’d love to see The Family. Looks hilarious! Cloudy with a chance of Meatballs 2.. I am taking my son this week!!! Thanks again!!! This is so not family friendly, lol, but I want to see Machete Kills. My daughter, husband, and I have been excited about seeing Cloudy With a Chance of Meatballs 2 since we saw the first advertisement for it! We are excited to see Cloudy with a chance of Meatballs 2. We loved the first one; the kids thought it was hilarious! I want to take my kids to see cloudy with a chance of meatballs 2! I’m looking forward to seeing Frozen! I want to see Frozen with my daughter. I can’t wait to see The Hobbit. I can’t wait for the new hunger games movie! I am most excited to see Prisoners hopefully we are going to see it tonight! I want to see Rush. Gravity and Baggage Claim both look like good ones to see. I would like to see Disney Frozen. It looks like a great family movie. I want to see Prisoners. i want to see cloudy 2 and frozen with my kids and Wall Street wolf with my husband! I am most excited to see Gravity. I’m waiting for all the Christmas movies to come out so I might take my granddaughters!! Lots of movies, but I heard they are remaking Romeo and Juliet so I am excited to see another rendition. My kids can’t wait to see Cloudy with a chance of Meatballs 2. They loved the first movie. The Grandmaster got excellent reviews from Athena New York Times, we plan to see it! Im excited to see cloudy with a chance of meatballs 2 and frozen! My kids and I are really excited about seeing Cloudy with a Chance of Meatballs 2. I’m really excited to see Cloudy with a Chance of Meatballs 2 with my grandchildren. for me it’s a toss up between ‘the hunger games: catching fire’ and ‘prisoners’.